My students learn so much vocabulary when we do a community helpers theme! First, there are new verbs as we learn what each profession does. Then we talk about where they work and what tools they use. Learning about community helpers in Spanish is an excellent way to learn new words. Community helpers in Spanish is one of my favorite themes because so much of the vocabulary is useful other contexts. However, there is also more language than in most other themes, so it is important to find ways to repeat and review. Songs are one of my favorite tools for learning and reviewing vocabulary. You can incorporate actions and pictures to support the meaning of the words. Kids can dance and move, and they learn better when they are moving. Singing lets kids practice structures before they can produce them on their own. Songs model native speaker pronunciation. Songs are a very efficient use of class time. One of the challenges of teaching community helpers in Spanish is the question of gender. Many of the songs opt to present all the nouns in the masculine. I make an effort to include pictures of the professions with both men and women and use both with other activities. Check out more of our favorite Spanish songs for kids grouped by theme. 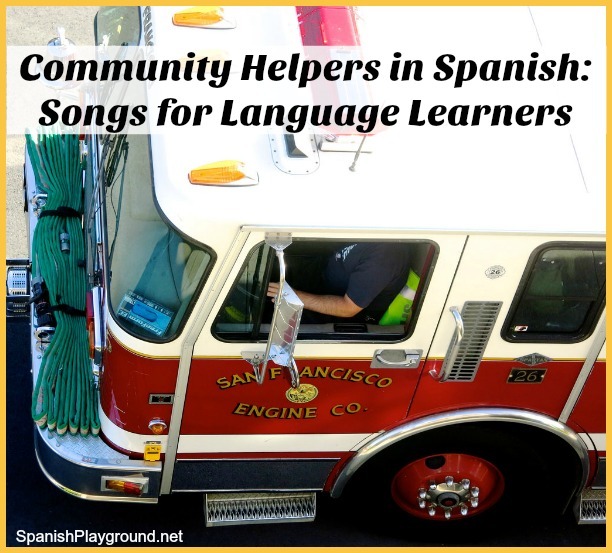 Here are a few of my favorites songs for learning about community helpers in Spanish. Some are best for preschool and kindergarten, but I’ve also included songs you can use with elementary students as part of a professions theme. I love this song, and kids love it too. It is bright and happy, and it is also structured to maximize learning. The song is cumulative, that is, it adds a new profession to the list with each verse and repeats them all. I hang coloring pages of the professions on the wall and we move down the row as we sing. You can hear a clip of the song and buy it from iTunes. This song includes verbs associated with each of the professions. We do actions for each (finally settled on listening with a stethoscope for the doctor). Miss Rosi is a well-known Peruvian composer and performer of children’s songs. She has songs for all kinds of themes and many work well with Spanish language learners. You can hear a clip of Trabajadores de la comunidad and buy it on iTunes. Susy Dorn composes and records excellent songs for Spanish learners. The sentences in this song follow a pattern: community helper, verb, object of the verb. I love this song for the mix of genders. As I mentioned above, it is one of the issues you have to address with teaching community helpers in Spanish. You can hear the song below and buy it on iTunes. Susy Dorn also has songs about specific professions. There aren’t videos available, but you can hear clips of the songs on iTunes: Los bomberos, El dentista and El cartero. If you are looking for a picture book to add to your community helpers in Spanish, you may be interested in this post about Oso en el trabajo.